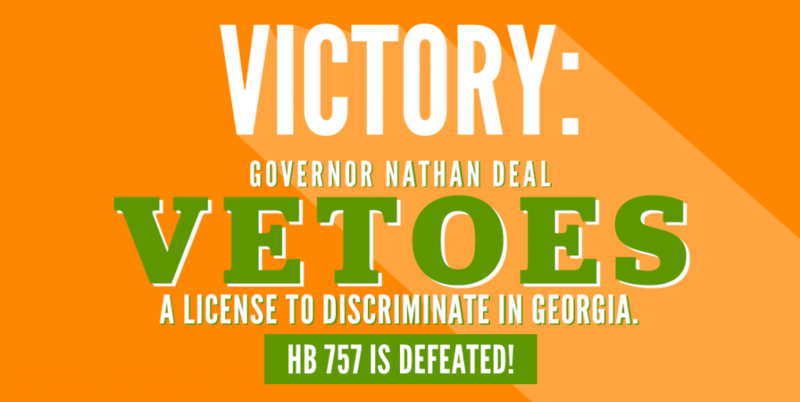 In an historic move, Governor Nathan Deal announced at a 10AM press conference today that he will veto HB 757, Georgia’s License to Discriminate. This decision comes as a direct response to months of advocacy and mounting pressure from an unprecedented groundswell of grassroots opposition, the Georgia Prospers business coalition of nearly 500 Georgia-based companies, hundreds of faith leaders, and criticism from lead conservative voices. In total, extreme lawmakers introduced 9 religious exemptions bills this year designed to give license to discriminate. None will advance. This statement is a perfect echo of comments he made weeks ago when he committed to rejecting any legislation that would give the perception that discrimination is welcome in Georgia. HB 757, Georgia’s License to Discriminate bill, would have done just that—and more. Far from a matter of mere perception, if Governor Deal had signed HB 757 into law, it would have explicitly legalized discrimination against LGBT Georgians, single women, religious minorities and more. Governor Deal had called on lawmakers weeks ago to send him a “compromise” bill that adequately balanced some faith beliefs and the dignity and civil rights of LGBT Georgians. Cleary, HB 757 didn’t cut it. This bill was by far the most egregiously discriminatory legislation that the state proposed all year. It did nothing meaningful to advance non-discrimination measures for the LGBT community or others—people who are already some of the most vulnerable in Georgia because the state lacks laws banning discrimination. We do not have to discriminate against anyone to protect the faith-based community in Georgia. Pressure for a Governor veto reached an all-time high in the past two weeks, with fair-minded Georgians generating 100,000+ messages calling for Gov. Deal to reject the heinous HB 757.
Business opposition hit a boiling point when entertainment industry heavyweights including Disney, the Weinstein Company, Time Warner, and Netflix weighed in warning that they would relocate major forthcoming productions to other states if Governor Deal signed the License to Discriminate into law. These threats came on the coattails of opposition from every major sports team in Atlanta and foreboding statements from the NFL alluding to plans to strike Atlanta from the shortlist of host cities for 2019 and 2020 Super Bowl events. 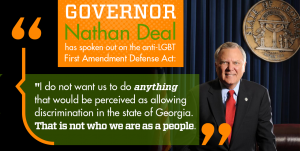 Today Governor Nathan Deal vetoed with his conscience and in strict accordance to his own faith values. But he also showed admirable leadership. Despite the agendas of some fringe party members, Gov. Deal worked in the best interested of a vast majority of Georgians who oppose legislation that promotes unfair treatment and support LGBT-inclusive non-discrimination laws. Looking forward, the next frontier will be passing comprehensive non-discrimination protections. But for now, advocates, businesses, faith leaders and fair-minded lawmakers celebrate a hard-earned victory. You can take part by clicking here to send a message to Governor Deal thanking him for his leadership in vetoing HB 757 and standing against discrimination.